Industry Standard for Advanced Grade Yangqins. Ideal for Yangqin advanced players to further polish their skills. This 402 Yangqin is crafted by Yuehua, one of the most experienced and established Yangqin manufacturers in the capital of China. Made out of Fine Woods, this 402 Yangqin is decorated with Diamond-Shaped wood pattern covers, one of the most representing classic design of the Yuehua Yangqins. As a significant milestone for Yangqin making since the 401 model, the sound quality and sensitivity have been greatly improved by redesigning the bridge heights and resonant structure of the 402 model. Yangqin beaters, Yangqin bag and Tuning Key included. This Yangqin set also comes with a Yangqin stand, to ensure accurate shipping charges, please add the following Yangqin stand (link) to your shopping cart when check out! 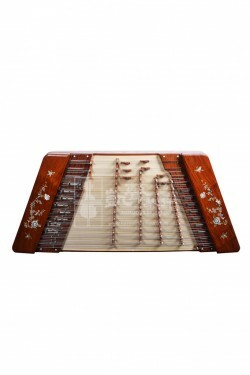 If you do not require the Yangqin stand, you can check out with this Yangqin right away.